Rusty Arrington is Calvary’s Student Minister. He has been serving in this position since April 2006. 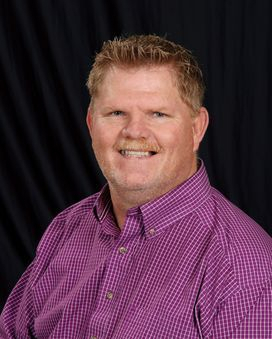 Rusty is bi-vocational and also works full time as a Facilities Supervisor in Carrollton, Texas. Rusty has been married to Rhonda since 1987. They have 2 daughters: Tristan who is studying to be an Elementary Teacher and Torie who is a Professional Ballet Dancer. Rhonda and Torie both are active at Calvary and Tristan is attending a church in Tyler, Texas. Rusty enjoys playing any sport he can. He also likes to sew and performs each year in the “Nutcracker Ballet”. His favorite pass time is to hang out with his family and youth group. "Command and teach these things. Don’t let anyone look down on you because you are young, but set an example for the believers in speech, in conduct, in love, in faith and in purity. Until I come, devote yourself to the public reading of Scripture, to preaching and to teaching."